Disney on Ice - Frozen, the studio's 53rd animated feature, puts a modern spin on the classic Hans Christian Andersen fairy tale. The Tale of an Unlikely Friendship - Director Benjamin Renner discusses the making of his beautifully crafted, 2D feature Ernest and Celestine. Khumba Earns Its Stripes - The scoop on South African indie Triggerfish's second feature. Swept Away - The team behind the two Gruffalo specials delivers another family gem, the charming CG-animated special Room on the Broom. Oscar Contenders: 2013 Edition - The annual face off between major Hollywood toon blockbusters and independent efforts makes for another nail-biting Best Animated Feature race this year. 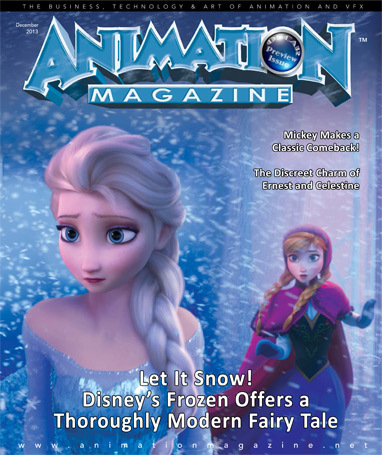 Frozen, Ernest and Celestine, Khumba, A Letter to Momo, Cheatin’, Room on the Broom, Oscar Contenders: 2013 Edition and much more!